Sophie joined the University of Exeter in November 2018 following completion of an MSc by Research at the University of York. During her time in York she specialised in the biology of non-coding RNAs, investigating the molecular machinery involved in the biogenesis of microRNAs. Now based in the Living Systems Institute (LSI), her current research is investigating non-coding RNAs in the context of neurodegenerative disease. 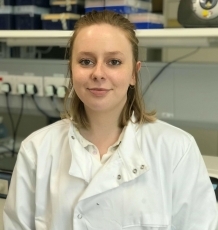 Sophie's PhD project focuses on the interactions of non-coding RNAs (ncRNAs) and aging pathways in driving motor neuron degeneration in Amyotrophic Lateral Sclerosis (ALS). ALS is a progressive disease characterised by the death of motor neurons in the central nervous system. Currently there is no effective treatment available for this fatal disorder, her project aims to investigate potential biomarkers and/or therapeutic targets in the context of ncRNAs. Sophie works in the laboratories of Dr Akshay Bhinge and Professor Andrew Randall, based on the Streatham Campus.